Well last night was the earliest I’ve been to bed since I came to Asheville for Beer Week. Every night I’ve been out drinking and enjoying the food, libations and culture that Beer City USA offers. Last night, I wanted to stay out late, but my body wouldn’t let me. C’mon liver, just one more day. You can do it! Anyway Let me recap what I can remember of yesterday and what I have planned for the last day of my beercation. The day started out as the previous ones, with me waking up and heading downstairs for breakfast and the all important coffee. Using a combo of my wordpress app and my laptop, I was able to get yesterday’s post up quickly. I then packed up everything to go check into Hotel Indigo for the last night of my stay. I arrived at this hotel and walked in, kind of overwhelmed on how posh it is. Thanks again Mom Linda for getting me this room for my birthday. Once I was situated, it was time to walk down to Roger McGuire Green to wait in line for the festival. Once in line I met some Knoxvillians, and their Asheville friends. I am so sorry I forgot y’alls names. I am horrible with names and have to hear them repeatedly before they stick. It’s a serious flaw of mine and it’s something I struggle to overcome every day. The festival was sold out, but when I looked on my Craigslist app, I saw that many people still had them listed for sale. I gave the number of one seller to a person in line without a ticket. I saw him later in the festival. 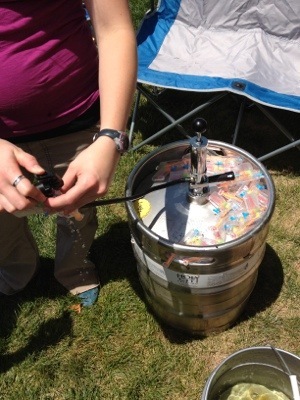 Once I got in, I made a quick round just to see what there was before I actually even got a beer. My first one was Brown Shugga by Laqunitas. There’s no way I would have remembered that on my own, thank goodness I logged every one of them into untappd. 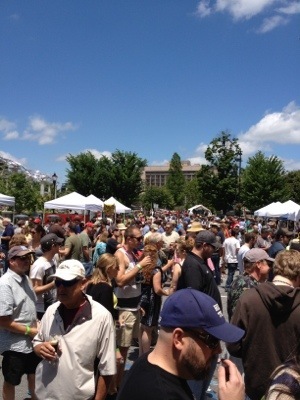 I saw many people I know from the beer scene at festival. 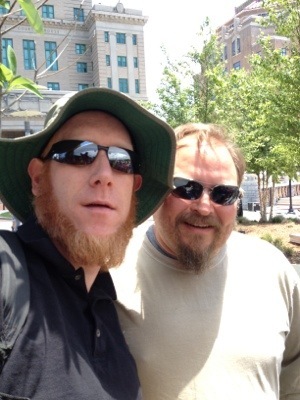 One of my favorite people in the regional beer scene is the brewer from Catawba Brewing Company, Todd. Him and his buddies (sorry the whole names escape me thing) are really cool and down to earth. Todd makes absolutely amazing “special edition” or “one offs” beer. 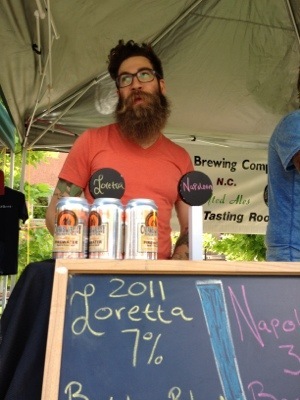 The last beer festival I was in Asheville for (see my Winter Warmer post) my favorite beer was his Pumpernickle Rye. 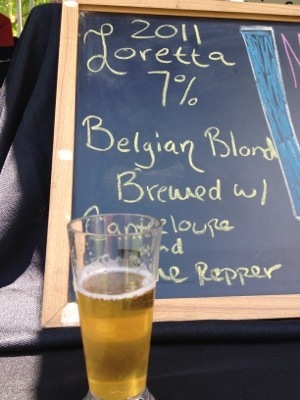 We spoke for awhile and I had his Belgian Blonde brewed with cantalope and cayenne. The combo was unbelievable and set the back of my throat tingling. Someone please let the owners of Catawba know that they need to let Todd bottle some of these rare beers so we can take them with us! I walked aroung the festival collecting stickers, coasters and other swag for my beer cave, and to share with friends. New Belgium had cool stuff such as bike tube patches, lip balm and ranger patches. The coolest swag at the fest went to Holy City Brewing out of Charleston, SC. They had squirt guns! Someone was filling them up with water and handing them out. I got one, but it was apparent that carrying it in my pocket was not a good idea since it was leaking. I used it to rinse my glass between rounds. Someone suggested filling it with beer, but I took a pass on that idea. I walked around enjoying beer and talking with brewers and other people I knew from the beer scene. 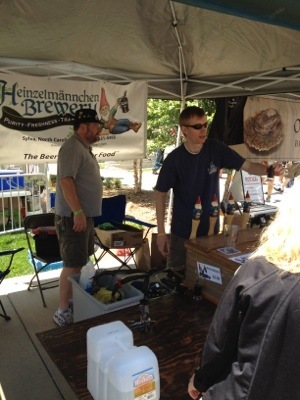 I went to the Asheville Brewing Company booth where I saw Mike Rangle. Always a pleasure to speak with him. He introduced me to the brewer, Doug. I had seen him before, but this is the first time we had actually met. I told him how much I enjoyed his beer and that Ninja is my all time favorite porter. After seeing him, I ran into Dieter from Heinzelmannchen. It’s always a pleasure to speak with the friendly Dieter. My only regret is that I don’t have time to visit his brewery this trip. I’ve have to make a point of next time taking a quick trip to Sylva, NC. Near the end of the festival I waited in a super long line for Thirsty Monk’s Coconorm porter that they released at 3pm. I liked it very much, but it still wasn’t as good as Tennessee Valley Homebrewers Club member Jay Schrade’s toasted Coconut Porter, but it was a close second. 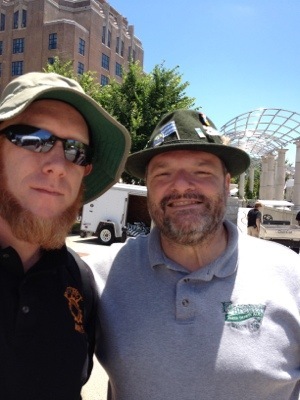 Next I spent some time hanging out talking beer with Greg and the crew from Nantahala Brewing Company. They had their newest Trail Magic release, an imperial IPA with lemon grass. They are having a bottle release at their brewery on June 8th. Bryson City is not that far of a drive, and it’s a beautiful one. If you haven’t been to Nantahala Brewing Company, you should go. You are seriously missing out if you don’t. Beer City Festival ended at 6 pm, but I made plans to leave early to go take a power nap at the hotel. While I was at the Festival, many of my Knox Beer Crew Friends were out in Asheville bar hopping. I planned on hanging out with them in the evening, but I knew if I was going to do more drinking, I would need to recharge. So around 4:30 I grabbed a couple of slices of Barley’s pizza and headed back to the hotel. I drank some tea, took a vitamin and set my alarm for an hour long nap. Waking up feeling refreshed, I hopped in the shower, got dressed and walked over to Thirsty Monk where I met up with Nick, Jeff, Matt and his wife Chrissy and her friend. I could tell the guys were feeling a little on the drunk side. I had half a pour of Evil Twin’s Imperial Biscotti Break. While hanging out there I saw someone posted on twitter that Tom Selleck was at Craggie Brewing company, just a few blocks away. I casually mentioned this to the guys. In their inebriated state, they thought it would be hilarious if we had our drunken pictures taken with him. The next thing I know we are on our way. We get there, and Tom Selleck WAS there. Just in Velvet painting form, behind the bar. We had been punked! Well played twitter, well played. We had a round anyway and Matt and I posed for the below picture. 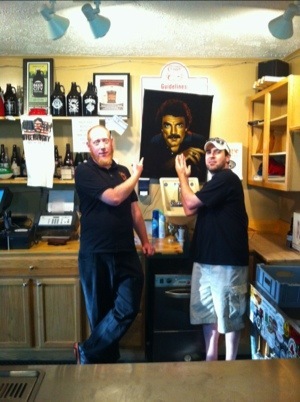 We saw on Twitter that Tom Selleck was at Craggie Brewing, so my Knox Beer Crew friends thought it would be funny to go get our picture taken with him. It was funny! After 1 drink at Craggie I convinced the crew that walking a mile away to Wedge Brewing company wasn’t going to kill them, so off we went. Wedge is one of the most popular places for craft beer lovers in Asheville to hang out, so sometimes they run out of some styles of their beeer. I had a half pour of a hoppy Hellesbock. After sitting around, talking and eating peanuts and Nick nommming down on tamales from the food truck, we decided to head back. As we walked I got a text to meet with Mary and Orion for dinner. I said goodnight to the crew, and when to meet them on Wall street downtown. We walked around trying to figure out what we were in the mood for. We ended the night at the Noodle Shop. I was pretty much done at that point, and my stomach hurt. I could only eat a few bites. As much as I wanted to go back to Thirsty Monk, I knew there was just no way. As we walked back to the hotel we heard a women yell out “He stole my purse!” On the other side of the road a guy was running down the sidewalk. A couple of people tried to stop him. He pushed one guy down. There was a crowd chasing him. I hope they caught him, the women got back her purse and no one (but the thief) got hurt. On our walk to Wedge, Matt found time for one of his favorites. 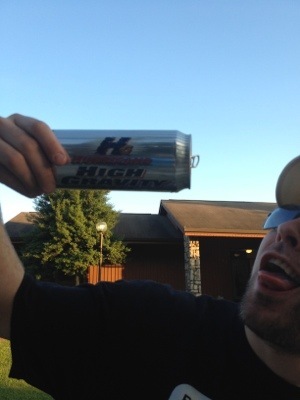 Hurricane HIGH GRAVITY! 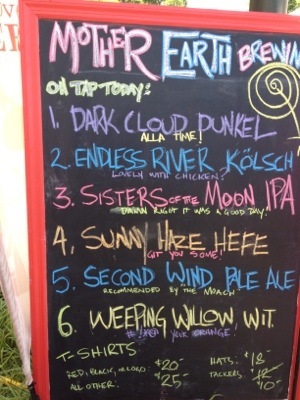 This is my last day, and the official last day of Asheville Beer Week. I have so much beer and beer swag, I am worried I don’t have enough room in the car for it all. I still need to stop by Bruisin’ Ales and pick up a few more things for myself and for friends back in Knoxville. I get to end my beercation by going on the LaZoom Beer Run tour today. I heard it’s hilarious and I’m really looking forward to it. I will post about it tomorrow. If we met this week, or you’ve been reading my blog, I’d really like to hear from you. Please leave me a comment. 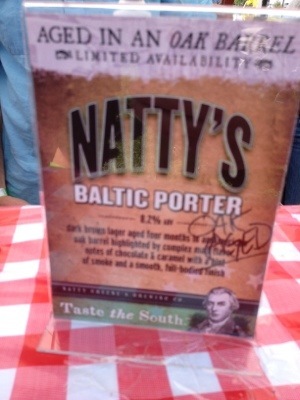 This entry was posted on Sunday, June 3rd, 2012 at 12:35 and is filed under #AvlBeer, #knoxbeer, #NCbeer, Asheville, Asheville Beer Week, Beer City Festival, Beer Festival, beer travel, Craft Beer, Drinking, Knox Beer Crew, Knoxville beer blog, Ratchet. You can follow any responses to this entry through the RSS 2.0 feed. You can leave a response, or trackback from your own site. 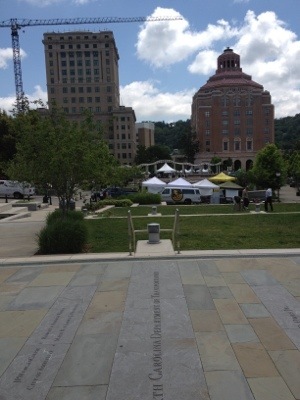 I have lived the Asheville Beer Week vicariously through your vivid posts. Thanks for keeping all of us who couldn’t attend up to date! See you soon Ratchet.